Before the fall of the Roman Empire there were massive amounts of inflation. This was due to the fact that the government had been debasing the precious metals. It had gotten to the point where silver coins were truly bronze coins dipped in a silver coating. This was the first form of fiat currency. As the inflation increased the people of the empire were demanded to work more and pay higher taxes. However, those who had held on to the pure gold and silver coins were able to fight off inflation. Eventually the Roman Empire collapsed because it could no longer sustain itself and pay the debts that it owed. Other countries began to invade the empire to gather spoils in order to pay off their debts. Unfortunately it was citizens of the empire who truly suffered from starvation and disease from these wars. Only those who were able to fight off inflation with pure gold and silver thrived during this time. In many subsequent financial disasters throughout time gold and silver were used as a safe guard. Yet today many of us place more value in a paper dollar that takes 4 cents to print. There used to be a gold standard behind the dollar but that is no longer true. The dollar is only worth the value that the government places on it. Just like Rome all subsequent fiat currencies faced the same ill fate. There has never been a fiat currency to truly prevail. We must look back on history to get an understanding of our future. There will be another collapse of the fiat currency. So we must prepare. Silver is considered the poor man’s gold. You are able to purchase more amounts of silver than you can with gold. However, there is a limited supply. This is why it is called a precious metal. Historically there is 12 to 15 ounces of silver produced to every ounce of gold. We cannot continue to produce unlimited amounts of products using silver. Research has even shown that the actual supply of silver is rapidly decreasing. As the supply decreases with a steady demand there will be a higher price point that comes along with it. Therefore as a prepper we must buy precious metals especially silver as a financial insurance against a failing economy and potential economic collapse. The financial crisis of 2001 and 2008 is nothing like the Great Depression that we could possibly face again. As in the story of how the great Roman Empire fell due to a collapse of the fiat currency system we will inevitably face the same fate. Many Romans thought they were simply too great to fail. Our mindset is the same today. Only those who held pure gold and silver coins were able to fight off inflation during that time. 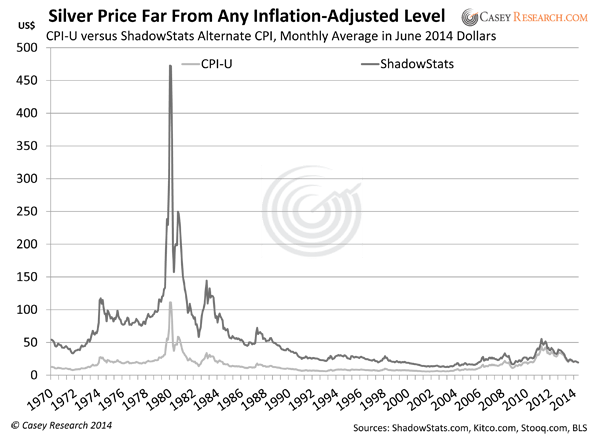 Here is a chart below that shows how silver consistently keeps up with inflation. During a collapse or financial crisis banks will either limit withdrawals or even forbid you from withdrawing your own money from the bank. This happened in Greece in 2015. Military soldiers were even stationed around the banks to protect them. We also saw this in the economic collapse of Argentina. Silver coins especially those that are minted can be quickly liquidated. In the time of an emergency they can be melted down in exchange of the relevant price. Many stores that will no longer accept fiat currency during a collapse will quickly accept silver instead. Buying silver won’t be an investment that will get you rich quickly. It is meant to be a safe guard and financial insurance. However, during a collapse you can expect the price of precious metals to exponentially increase. As I mentioned earlier, silver is used to produce multiple products. Many companies such as Apple depend on silver to produce their monitors for their highly popular iPads. If huge companies like Apple begin to lose access to something that causes them to lose profits then chaos will ensue. They will of course drive the price of their products higher. Silver is a precious metal. Eventually the supply will dwindle. Again this will cause the price of silver to sky rocket. On top of that you have countries like China and Russia who are buying up huge supplies of these precious metals causing the supply to decrease even more rapidly. Not only is there a decreasing supply of silver on the market but there is price manipulation that is currently happening in the market as well. Historically you were able to purchase 12 to 15 ounces of silver for the price of 1 ounce of gold. However, there you can now purchase unheard of amounts of silver. Currently you can purchase around 50 to 70 ounces of silver for the price of an ounce of gold. Historically these prices have always adjusted themselves. For some reason speculators are setting these unheard prices. Eventually the market will adjust themselves. This means that the price of silver will increase exponentially. At that point it may be too expensive to even purchase silver. The type of silver that you purchase will be dependent upon the type of buyer that you are. As a prepper I recommend buying minted silver coins first. This is because minted silver coins can be easily liquidated in an emergency. They have a set price on them which means they can be used at stores to purchase items. The minted coins such as the United States Silver Eagle will be trusted as real silver as compared to silver rounds or unrecognized mintage. I started off buying minted Silver Eagles. Regardless of what happens in the economy the coin will always be worth it’s weight in silver. Junk coins are the next best option. Although they are not 100% silver they do have about 90% silver. Junk coins are coins that were produced before 1965. In the event that there is an economic collapse junk coins will generally be accepted because they are widely recognized for their silver content. Generic silver rounds are another great option. However, without mintage it may be more challenging to liquidate than minted coins. If you do get silver rounds I would recommend purchasing popular types of silver rounds such as the Buffalo. The best time to purchase precious metals are when it is the cheapest of course. At the time of this writing the silver to gold ratio is at a ridiculous 70 to 1. That means that you can purchase 70 ounces of silver for the price of 1 ounce of gold. This is why it is prime time to purchase silver. Eventually the difference will be reconciled. At that time it will be impossible to purchase huge amounts of silver. Also, if you look at the state of our economy you can tell that it is time to purchase silver. Inflation is increasing at astronomical amounts. Millions of people are without jobs. These are all signs of a looming financial crisis or economic collapse. If you can’t afford to purchase huge amounts of silver I would recommend purchase at least 1 coin a week from SD Bullion. They have no purchase minimum unlike many other stores. They update their pricing to reflect the price of the market every couple of minutes. You could purchase at local coin stores but I have noticed that they charge huge premiums on coins. The most that you want to pay on a premium for minted coins is about $3 or $4. I’ve seen local coin shops charge $6 to $7. Now yes you will have to pay for shipping. However, SD Bullion charges a flat rate of $7.77. It isn’t dependent upon how much you buy. So this means that you can purchase more silver or bullion and spend less on shipping as compared to other stores. 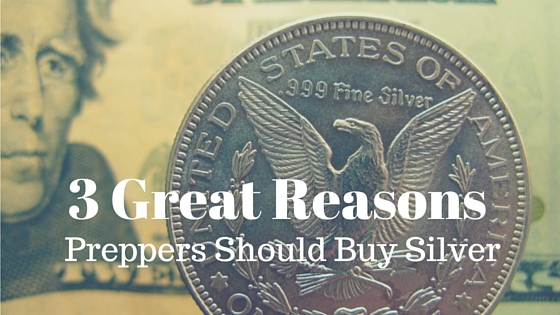 Leave a comment below if you have any questions about buying silver or about SD Bullion. I have been purchasing bullion through them for quite a well. So I am familiar with their products and services.